A couple years back, dad and I were returning to Missouri to do some fishing…and had made our way east from Kansas, where we had been pheasant hunting. We decided we would pull in and take a look at the horrible tornado damage that had occurred earlier that spring in Joplin and in doing so traveled south along 49/71 through Lamar, Missouri. Now Lamar might not pop up on your memory screen and you might be scratching your head and asking what is special with Lamar? Lamar is and will always be the hometown to our nation’s 33rd president, Harry S. Truman. Now if you know this area of Missouri then The Ozarks should pop up immediately and in fact Lamar sits just west of Bennet Spring, Missouri which is one of my most favored places anywhere! President Truman was an attachment to history in that he was the final running mate of FDR who passed away in 1945 handing off the presidency to the younger Mr. Truman of Missouri. What a connection this would have been and for many of you the combination of Roosevelt and Truman were the lock and key for getting our country up and out of the rut of the 1930’s that was The Great Depression and the Dust Bowl Era. If you drive anywhere is the Show-Me-State then you will run into Mr. Truman and his legacy on both the outdoors but specifically his love for fishing; Truman Lake or better known as Truman Reservoir is located in north central Missouri and is the state’s largest man-made reservoir with a surface area of 55,600 acres. The lake was authorized and construction began in 1964; it was named after President Truman in 1970 and completed almost a decade later in 1979. 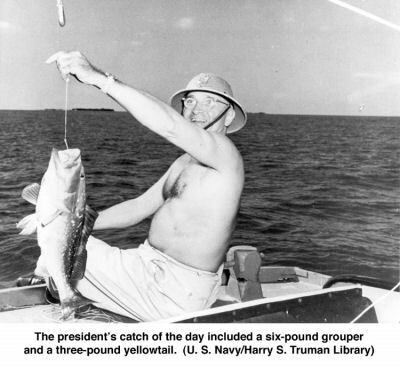 One of President Truman’s famous fishing adventures took place off the Florida coast while vacationing in the Key West area in November of 1946. The word is there was cheating and betting involved with this fishing trip…neither resulting in a congressional hearing. There were two groups of dignitaries and as Clark Gifford (president’s special council) was boarding his ship a comment was made; there was to be a bet laid on who would catch the biggest fish of the trip along with the single largest catch. What Gifford didn’t know was that the President’s group and boat had already been out earlier, landed a few nice fish…and had plans on counting their fish towards the bet! Guess it’s good to be the President and have some connections; as the story goes #33 wouldn’t need the extra fish that were smuggled on board as he caught the first fish (a 6 pound grouper) as well as the second catch which was a 3 pound yellow-tail and a few others that took the President’s limit up and over 15 pounds. Seems like a great group of guys were out having fun fishing and doing their part to relieve the stress involved with being the most powerful man in the world. If presidential stress were to be measured then Truman might have just led all others; one needs not go back any further than to early August of 1945 whereby he was faced with quite possibly the most controversial decision a president had ever had to make up to that point…the Manhattan Project was successful and there in his control was the most devastating weapon known to man, the nuclear bomb. After four long years of involvement in WWII Mr. Truman had to make the decision to use a bomb that no one else worldwide had ever seen the likes of…regardless of how you view the decision the Enola Gay dropped the bomb on the city of Hiroshima and 70,000 Japanese would be vaporized…bringing about an end to the worst war our planet had ever known. As I sit here, reading and carefully pondering the magnitude of President Truman’s decision I can only comprehend that taking a fishing trip was well in order…and much needed. This seems to make my daily decisions a mere drip of water but leads me to once again love the feeling and need of an open stream ahead to make more clear which way a person should go on various topics. Seems to me that taking a stroll down the gin clear water of Bennet Spring might have just been the ticket needed by Mr. Truman in the days leading up to early August of 1946. This upcoming year of 2014…give Mother Nature and a fishing trip a thought…you might be surprised at how helpful catching a fish can be in making life a bit more clear as we all Enjoy the Great Outdoors!